A good Keynote presentation requires a number of critical elements: an engaging presenter, compelling information, and beautiful slides. Apple's Apple's Keynote ’09 ( ) can provide that last part, with 44 themes––the styled slide templates crafted by Apple’s designers. But even Apple's elegant templates can’t suit every occasion, and you may not always have time to design themes from scratch. That’s when you can turn to other designers, who have created original Keynote themes for sale. Once purchased and installed––some are even free––these new themes appear in the Theme Chooser alongside Apple’s offerings. Each brings new designs, animations, and templates to use as-is, or to customize. This brief guide will help you find new Keynote themes for your next presentation. Keynote Theme Park offers 24 attractive, business-oriented themes. Most have more than a dozen master slides, and many sport patterns that connect with other slides across transitions to give the illusion of one continuous design. Most themes are available in standard 4:3 resolution, but one, Spotlight, is also available in a widescreen high definition format. The site also offers, for additional charge, supplemental graphics such as national elements, curtain animations, and extra master slides for some themes. Prices: Individual themes, $20; sets of three, $40; two collections of 12 themes, $100 each. For sheer volume, iPresentee is hard to beat. More than 100 themes are available, plus there are separate bundles of animated backgrounds, clip-art, 3D objects, and more. Most themes are available for Keynote ’08 or ’09 only and come in standard 4:3 and widescreen HD resolutions. Themes provide up to 26 slide templates each. Designs are a mixed bag––many are flat and simple, but others, especially those imitating real-life textures like fabric and stone, are more stylish. Prices: Individual themes, $10; bundle of 52 animated themes, $40; bundle of 60 static themes, $30; 115 QuickTime animations, $25; 181 3D objects, $25; collection of all four bundles, $70. iPresentee’s free Autumn Colors theme. Jumsoft offers 50 crisp, colorful themes focused on natural textures. Each theme is designed for Keynote ’08 or later and contains up to 14 different slides at standard and HD sizes. Themes are sold only in bundles. Prices: Set of 25 static themes, $39; set of 15 animated themes, $39; set of 15 animated themes plus hundreds of photos, animations, and backgrounds, $99; set of more than 100 3D rendered objects, $39; set of 35 animated backgrounds, $49; set of 100 animations, $45. Divine Fiat’s 14 themes tend to be simple but boast clean, attractive designs suitable for a range of topics and audiences. 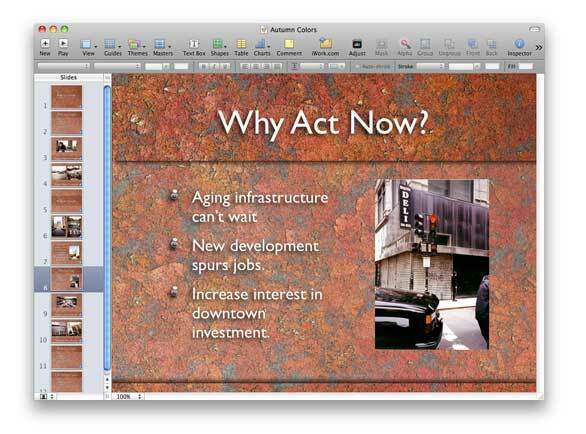 Themes offer as many as 80 slides at standard to HD sizes, and some require Keynote ’09 to work. Each theme includes extras such as customizable icon objects, custom texture and color palates, and video tutorials. Prices: Individual themes, $26; bundle packs of two themes, $47; set of all themes, $130. Keynote Zone's free Comics theme. 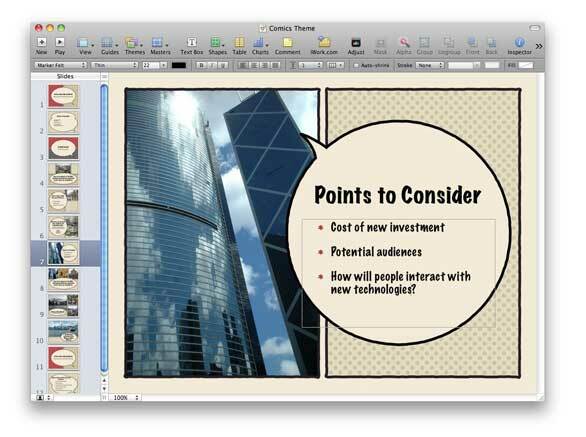 Other theme sites include Keynote User, KeynotePro, and Keynote Zone––its free Comics theme is especially appealing. But even sites without free themes provide screenshots, QuickTime movies, or both to give you an idea of what different designs offer before choosing one that’s right for your presentation.